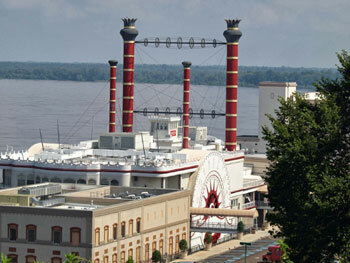 Located just west of Jackson in historic Vicksburg, Mississippi, Ameristar Casino Hotel Vicksburg offers an exceptional gaming and entertainment experience. The property features a 70,000 square-foot casino; a full-service hotel with 149 well-appointed rooms, a pool, three dining venues; 2 bars/entertainment venues and a full-service RV park. The spacious casino consists of 70,000 square feet of gaming excitement, with a complete selection of popular slot and table games. At Ameristar Casino Hotel Vicksburg, when we say "More Fun," we mean it literally: With more than 1,500 of the latest and most popular slot and video poker machines, we offer more games, in a wide variety of play denominations, than any other casino in the area. You'll find everything, from penny slots all the way up to the $100 machines, in the High Limit slot area on our casino floor. And we have the widest selection of video poker around including single or multi-hand video poker. Look to Ameristar Casino Hotel Vicksburg for all of your favorite casino table games and a variety of table limits. Enjoy Blackjack, Craps, Roulette, Let It Ride and Three Card Poker, to name a few, as well as the latest specialty games. Our dealers are ready to count you in. Just pull up a chair and let the games begin! Bet Big and Win Big at Ameristar! We offer the highest stakes around on several of the most popular table games. You can now bet up to $2,000 on select Blackjack, Craps and Roulette games. Ask your Pit team for details. From the casual atmosphere to the friendly service, Bella's Bakery & Cafe is the perfect choice for a quick and delicious meal. Our selection of specialty pizzas and sandwiches, as well as Southern favorites such as Po Boys and spicy Hot Wings, make Bella's Bakery & Cafe a great place to catch a game or meet friends. Southern hospitality. Sit a spell with us and you'll experience the region's legendary graciousness -- not to mention the best Smokehouse BBQ -- served straight up. Why not start with our Crab Martini, then move on to such favorites of the Deep South as our Smoked Baby Back ribs and our signature Top Sirloin? It's Delta Magic on a plate. . .
At Ameristar Casino Hotel Vicksburg's Heritage Buffet, guests travel between food stations, sampling cuisines from all over the world -- including such great American classics as Prime Rib. And our renowned seafood buffet is justly celebrated as the best in Vicksburg. Some of our dining stations feature interactive display cooking and they're action packed, including the Italian station where pasta is on the boil in steaming pots. It's an exotic ride but one that, as the historic photos of Vicksburg and other parts of the Mississippi Delta on the walls remind you, you can savor without straying too far from home.